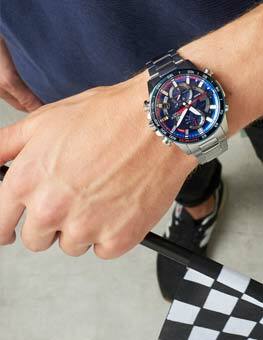 Citizen Regent EW1824-57D to niesamowicie przyciągający uwagę zegarek damski. Materiał, z którego wykonana jest koperta to dwukolorowy - stalowy ze złotym, co świadczy o wysokiej jakości produktu, natomiast tarcza nadaje zegarkowi charakteru przez swój wyjątkowy perłowo biały kolor. Zegarek wyposażony jest, między innymi, w funkcję daty. 100 metrowa wodoszczelność umożliwia pływanie oraz płytkie nurkowanie z zegarkiem na ręce. I've owned this watch for at least a couple of years, maybe more and love it. It has been superbly reliable and the face doesn't have a single scratch on it and I wear it everyday. It is timeless and elegant and has been worth every penny. The watch looks much better in real than at the picture! It was a Christmas present for my wife and she is excited by this watch. The watch face looked good, though its difficult to see the date properly. Would recommend it. I received this watch as a gift for my birthday from my husband. I love it. It fits nicely, although I did need to get a couple of links taken out, but it was very easy and didnt cost me anything. To me, the watch is elegant but practical at the same time. I like the diamonds on it, but they are not too showy, which I like. I also like the way that the dial has slightly different colours depending on the way the light catches it. The face of the watch looks very nice/Comfortable to wear. Bracelet watch/silver and rose colour/easy to read watch face/nice and stylish. 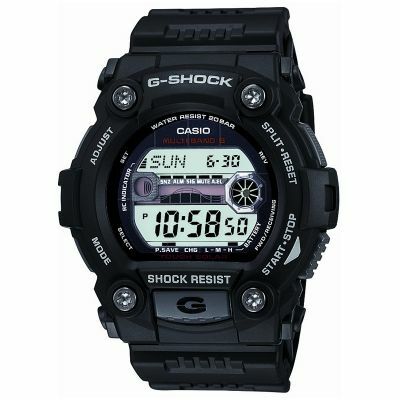 I would recommend buying this style of watch as Casio is reliable and it is very stylish. I bought this beautiful watch for my daughter for Christmas and she loves it! Some watches are too bulky and some too tiny, but this is slim and elegant yet the numbers are clear and precise. Unlike many watches, the date too, is easy to read. The two colour band means it can be worn with any outfit day or night, casual or formal. The pearl face gives it a spectacular shimmer and the diamonds, rather than making it look too flashy, add an air of class. 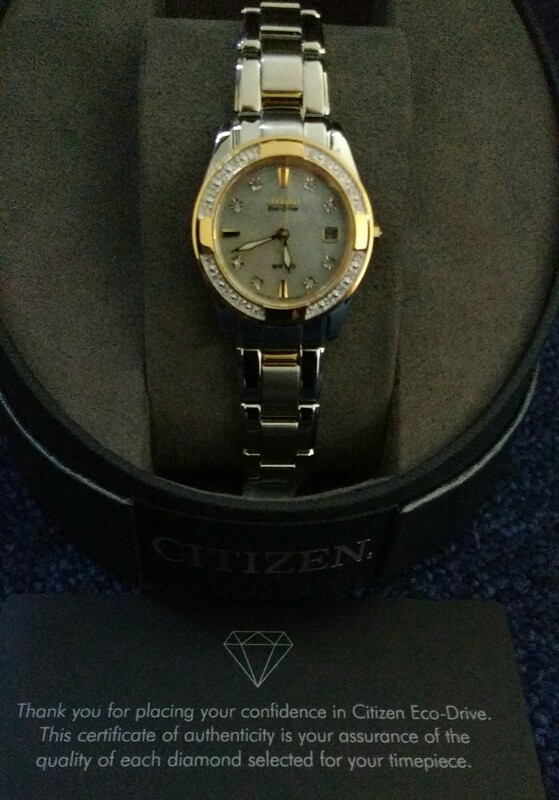 Being a Citizen watch, the big plus is not having to replace batteries and the 5 year guarantee meant I could buy with confidence. I also didnt have to worry about the fit, as the Watch Shop offers several easy ways of getting the perfect size, with clear instructions on site and on receipt of the watch, ensuring full satisfaction. I thought it would be a bit of a fiddle getting it set up, but it was even easy sorting out the correct date. On the whole, if all the instructions are read and adhered to, I would give this watch a definite 100%. My wife is very pleased indeed with her new Citizen watch. She particularly likes the mother of pearl face and the diamonds for hour markers. She is showing it to al her friends and recommending your company to them as an excellent company with first class service and delivery. 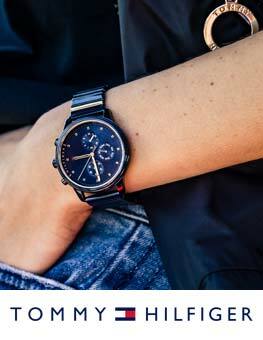 Really nice looking watch from a great company . I hope my likes it !!! Very pleased with my purchase. Just had to have one link removed from wrist band. Looks really nice on. Love everything about this watch. I wanted something to replace my 20 year old two tone Rotary. Liked what I saw and read about his watch and tried to find a local stockist so I could see it in the flesh before deciding. Had no luck with that so after reading reviews decided to order. I was delighted when it arrived. The style is perfect for me, elegant with subtle blind. Daintier than my Rotary making it a good watch for every occasion. The Eco Drive is a big bonus with no battery to need replacing usually when I am away from home. The date is smaller than my Rotary but not something of any consequence to me as I dont bother resetting it as required anyway. Although I am not a big swimmer its very convenient not to have to remove it when I do take the plunge. Congratulations to Citizen for making a watch that ticks all my boxes. I love this watch! Its stylish and practical! It was bought to replace a larger version that was stolen sadly! The diamonds give jistbenough sparkle without being over the top. The bracelet is a little large so you may find you need a link or two taking out. I was pleased with the Watchshops overnight delivery service to my local Goldsmith store. I am delighted with the Citizen Eco-drive watch. I didnt want anything too bling and this is just right. The diamonds on the dial & around the face are just enough to let you know its expensive without being too over the top, and the mother of pearl dial slightly changes colour depending on the light. I love that you can wear with any colour & style of jewellery as the strap is mainly silver but you pick up on the gold when you move. I have a very slim wrist & have struggled to find a watch that didnt take over my arm- its a perfect size. It was also great that although I didnt purchase at Goldsmiths I was able to take in & get it adjusted without any problems. I also love the fact i no longer need to get the battery changed! 5 year guarantee too! So I am very pleased with my order and it is something that I will get lots of wear out of for many years to come. What an absolutely beautiful watch. It goes with any outfit, and when the mother of pearl face catches the sun it looks amazing. I would fully recommend this product as a gift for a loved one or as a special treat to yourself! As always excellent service from the Watch Shop. I ordered the watch on a Sunday lunchtime and received it the next day. Amazing! Nice watch.Bought this watch because i always want to buy an ecodrive which is very unique and the technology behind it fascinates me. I am sure my daughter will like this watch as much as I do. As its water resistant to a 100 meters and has eco-drive it is sure to be around for awhile. This is backed up by the Citizen giving 5+1 years guarantee on it. Even if its left in the jewellery box for over 6 months the sun will recharge the battery. The only sightly negative thing I can say so not to sound like a watch salesman is that you would be hard pressed to see the date at a glance. The watch even comes with a Diamond authenticity card, which I hope will dissipate any cheapskate rumours about me. 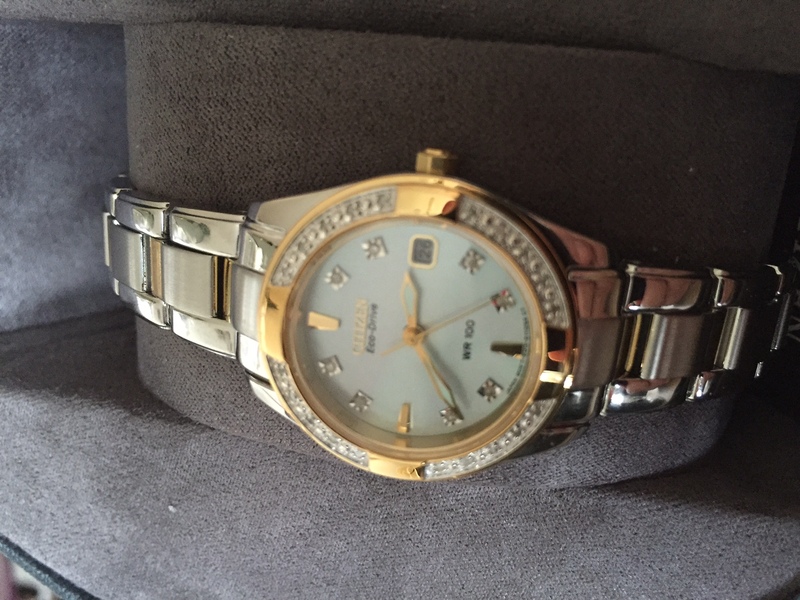 A very beautiful watch which my wife fell in love with when she saw it advertised on the TV. I said nothing but placed the order after reading more about its technical attributes& customer reviews. I ordered it late in the afternoon & was shocked that I had it at home the following morning how do they do that? I had it gift wrapped so never saw it in the flesh until Christmas Day. Well, it was obvious that the positive reviews were accurate both of the product & The Watch Shop in general. My wife recognised it straight away & shes been showing everyone what I bought her. So, The Watch Shop & I earned some brownie points. Its a lovely watch, well presented & makes a lovely gift. I am quite happy with my watch which I ordered online and picked up from a local store. Apart from a missed email regarding the arrival of the watch\\\\\\\\r\\\\\\\\nThe rest of the service was good. At the moment I have not used my watch as it is a present for xmas. I am sure it will be ok. Stunning watch with diamonds. Certificates inside and fast delivery with tracking. I have found this watch and I was very pleased to get it for my birthday. Unfortunately it did not arrived in time due to the two stage authorization procedure. The watch is beautiful and I am really happy with it. I bought this watch for my wife, and I think it looks really nice. It is small in diameter and thickness which suits her slim wrist, and it looks subtly sparkly. The watch arrived and I have been wearing it ever since, its very comfortable and the mother of pearl face very colourful. Very pleased with this purchase. Great watch, love the Eco-drive have worn one for years. This is a beautiful watch with a gorgeous mother of pearl face. The dual colour band means it does with all my other jewellery. Not too heavy on your wrist and feels well made. Quick, efficient service, would buy from again in future. The watch looks better in the flesh and was bought as a present for my wife. She loves it! My wife is an average size & has had to have 3 links removed to make it fit properly. As with most womens watches the date numeric is too small to be truely useful unless you can focus on small digits. All in all really pleased with it! In terms of the service, the watch was delivered incredibly quickly & the price was the best i saw anywhere. A quality watch at an affordable price. The Mother of Pearl face adds elegance and style, with the diamonds around the face providing a luxurious look. The subtlety of the diamonds around the outside give this watch a very sophisticated feel without looking too glitzy or showy. The weight and size of the watch is just right for me as l have quite a small wrist. The two tone effect makes it wearable with a variety of jewellery and adds to the overall well balanced design of the watch. that features a date function and ECO drive system, requiring no battery changes.The bracelet, with its secure clasp, was a perfect fit. My wife was delighted with a stylish watch suited equally to the rigours of a working day or the pleasures of an evening out! Great, elegant but not flashy. I love it and wear it everyday since I got it. : The colour is really nice and the watch isnt too big which is perfect for my thin wrist. I wish it was easiest to set up the correct date, and not having to do it every month according to whether Its 30 or 31 days. But that is really the only disadvantage Ive noticed so far. This was a birthday present for my wife and is a fantastic present. Very stylish and practical without to much bling. A little big but goldsmiths were able to fix for free. The watch was small enough for a ladies wrist yet large enough to read. The colours are very modern and light that will compliment any colour jewellery on the hand of a loved one. No complaints has it is what I wanted , apart from the date. Thought it would have been a touch larger. This is the perfect ladies watch. The diamonds around the dial are pretty, not ostentatious and soften the metallic element of the strap which being two-tone makes it suitable to wear with any jewellery. The mother of pearl face is beautiful and unusual and makes the diamond detail on it slightly subdued and therefore more elegant. I had intended to buy the Riva version which has a plain dial, but having seen the effect of this one in a jewellery store, I had no hesitation in choosing the Regent instead. It is light to wear, very easy to take on and off and perfectly suitable for everyday use, as well as evening. I would happily recommend this stylish and lovely watch to anyone. 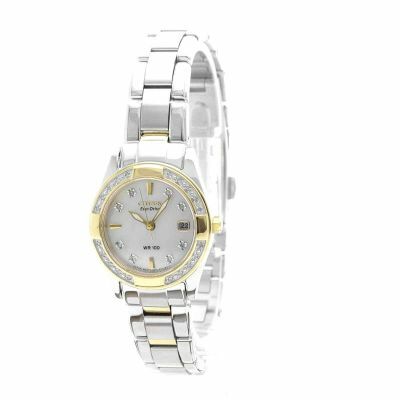 This is a beautiful watch which looks fantastic with gold and silver jewellery. The mother of pearl face looks lovely. It looks very classy, and the real diamonds look great without being too much. Bought this as a present for my mum for Mothers Day. She absolutely loved it, she has tiny wrists and it didnt look out of place or too large on her, but I did have to get two links taken out. As I hadnt seen it in person I was worried about how it would look when it arrived but it looks far more expensive than it is, and I think she would be shocked to find out how much I had actually paid for it. The date window is pretty small and she did comment saying that she would have trouble reading it but she didnt mind too much. I didnt realise that it was on a 31 day calendar and so will need adjusting every time the month has 30 days until it came to adjust the date. All in all its a lovely watch and I would definitely recommend it, I ummed and ahhed over spending a couple of hundred pounds on something I hadnt seen but neednt have worried as its beautiful and seems very good quality. I love this watch, had been looking for a new one for ages, and wanted this for Christmas, ended up treating myself!!! The two tone strap is really stylish and I love the pretty pearl face as it catches the light and shimmers. I chose Citizen as a quality make over a designer name who I feel would go out of fashion , this watch will hopefully last me for years!!! 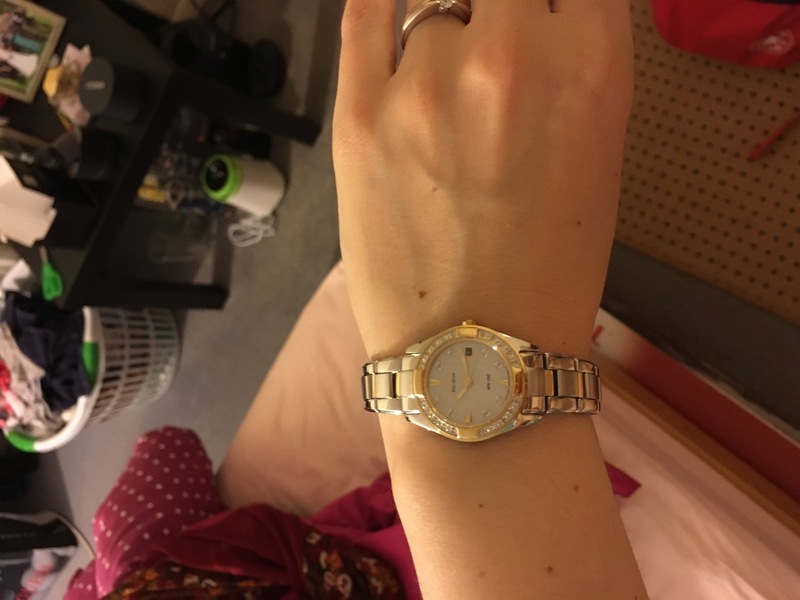 The stones and pattern around the face make this a glamorous looking watch, but also classy so I can wear it at any occasion, also the face is only the size of a 10p, which is as big as I would wear as I have slim wrists and feel a bit self conscious in anything bigger. We had to take four links out of the strap and the fit is very comfortable, I have been wearing it since it arrived!!! I also like that it will never need a battery, as is Eco drive and recharges by any light does not need sun!! This is a beautiful watch that I would recommend people to have a look at, treat your lady to, or If like me treat yourself, you are worth it!!! IIm so happy with this lovely watch. Its look amazing on my hand. Excellent watch for an excellent price. Good customer service. I have had an issue with the watch strap that they adjusted but am hoping this will be resolved. 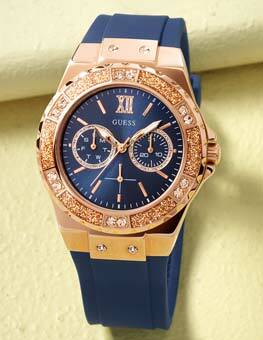 Beautiful watch, subtle level of shiny diamonds and gold, enough to make it pretty and sparkly! Everyone has a phone now with the time on it and more so any wrist watch has to been seen as jewelry with a secondary function now. This fitted the bill perfectly. The recipient is very pleased with this and has told me so on a number of occasions! In my opinion a very nice, stylish looking watch. Waiting for my wife to open at Xmas but I hope she will also be impressed. First class professional service from initial purchase through to delivery. Great communication and 30% cheaper than in the high street store, even though I could have collected in store. Watch arrived 24hrs after ordering, excellent service. The watch is a Christmas present for my wife and she will love it! Great watch very elegant stands out for its shine, face of the watch is a lovely pearl feature with the dimonds. Two tone colour of the watch is a good contrast really can wear this watch for every day use, happy with my purchase you would not be disappointed with this watch. The item was delivered as advertised and promptly so. The advertised pearl dial was neatly explained in the watch specifications so I am happy with what I received. I am very content with my purchase and will look to purchase further items from the Watch Shop in the future. Extremely happy with my purchase! It was so much cheaper than high street prices and such speedy delivery. Id definitely buy from watch shop agaiin. Very beautiful watch!!!! I already had nice comment about this watch. thank you for nice and easy service. Product as described quality service received watch next day best service Ive ever received. The watch is fab!! Love it, I have purchased this as a Christmas gift for my daughter and I am sure she will be thrilled with it. Very nice, bought as a gift, cant comment any further but i was very happy to give as a present formy daughter. This watch is absolutely beautiful!! It is going to be a watch that my girlfriend will be able to wear every day, and will look gorgeous with going out clothes in the evening. The mother-of-pearl face makes it look classy and the diamonds (instead of numbers) are easy to read in any light. I was a little worried when it didn't start going even after charging - and then I set the time and it worked fine!! Date and time setting functions are easy to use - unlike some watches the 'winder' is easy to operate. I ordered this watch for my wife as a Christmas present; it's beautiful and she loves it! It's just right. Not too much bling, not to big but it is obviously strong (it has a good clasp) and typical Citizen Eco quality. Great service from Watchshop as always. Just very disappointed with Royal Mail's failure to delivery before 1pm the next day as promised. I've asked Watchshop to complain on my behalf! Very stylish watch, jewels look quality, it's quite a weighty time-piece which I like but might not suit everyone ..the pearl face means it's good for work as well as going out! My wife is thrilled with the appearance and the features of the Citizen watch. 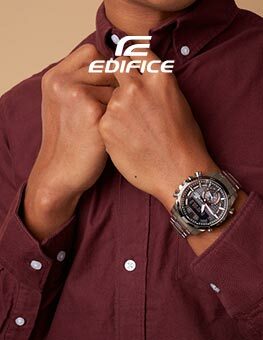 The ECO- Drive ensures that the watch batteries is always topped up. The two toned gold and Silver finish is enhanced by the stones around the dial and draws admiration from those that view it. I purchased this particular eco watch because I was tired of having to leave my old watch with the jewellers to have the battery replaced. The overall look of this new watch is very good and the mother of pearl face is especially attractive. The only drawback for me personally is the small date box on the face and find it very difficult to see the actual date but its not a facility I tend to use much and am very pleased with my purchase.